Stewarts of America provides a variety of standard and custom pins for industrial applications, including loose pins, custom pins, pointed wire products and other precision pins and needles for customers around the world. Stewarts of America provides a variety of standard and custom pins for industrial applications. Stewarts of America offers a wide array of pin designs. Manufactured on high precision machinery, the steel pins and needles we offer are available in various taper profiles, pin shapes, sizes and metallurgy. Pin bases can be plain round, keyed, or tailored to customer specifications. 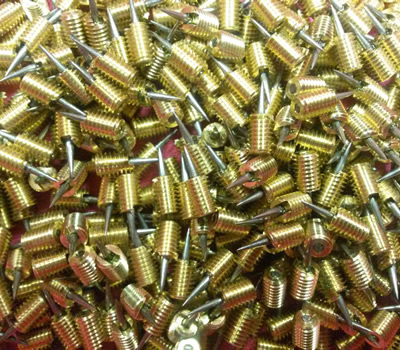 Stewarts keeps millions of different styles of pins in stock, and what we don't stock, we can manufacture custom to your requirements. Bright polishing, regular polishing, heat treatments, coatings etc. Adherence to tight tolerances dimensions and fine tip profile details. Alloy and stainless steel pins and needles are also available for applications requiring high abrasion resistance and non-corrosive properties.